Autographed Copy and Free Shipping Today! Part Four: Relax and Flourish Discusses the importance of relaxation, stress-reducing exercises, and the health benefits of practicing mindful breathing daily. The CD Relax and Flourish© is included. About the Author: Rita Schiano is the founder of Live A Flourishing Life©, helping people develop and tap into the skills and attitudes necessary for them to overcome personal and professional barriers, build resilience, and live a more flourishing life. Her workshops and mentoring programs offer insight and assistance that guides people towards actionable, positive changes affecting all areas of life. Rita She is an adjunct professor teaching philosophy, leadership, and stress management courses. She is the author of several books, including Live A Flourishing Life, the critically-acclaimed, semi-autobiographical novel Painting The Invisible Man, and Sweet Bitter Love. Her articles have appeared in The Huffington Post / AOL Healthy Living, the Worcester Business Journal, and Self-Growth.com, and as guest blogger for Psychology Today. As a speaker and featured presenter, Rita leaves her audiences motivated and inspired. "Life Changing" -- Live a Flourishing Life is a book and workbook that will change your life instantaneously. As you work through the exercises that are strategically placed throughout the book, you will enter a journey that ultimately changes your life. Throughout the book, Live a Flourishing Life, shares approaches in order for you to begin your journey, such as learning your stress triggers, learning to use Kaizen, and forming a "Bucket List." Inspirational quotes are places throughout the book, which allows yourself to think even if you are in a place that you fell "stuck." I have used this book several times and with each use, I have learned something different, but with each new discovery I know I am on a path to living a Flourishing Life. Included with this life-changing book is a relaxation CD spoken by the author, Rita Schiano. The calmness of her voice allows you to block all distractions that maybe swirling in your head. As you progress with the CD, I am certain that you will experience a peaceful calmness within. 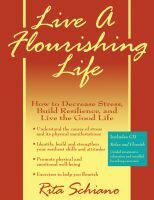 "A Life Changing Book" -- Written by popular teacher, author, and motivational speaker, Rita Schiano, Live a Flourishing Life is a comprehensive guide to becoming a happier, more successful person. The premise of the book is very simple and equally profound. By getting to know yourself you can change what needs to be changed in order that you may better learn and grow. Included in it a CD that guides you through two helpful exercises that will assist you in this process. This comprehensive guide to learning your obstacles on your road to success and happiness is based on the ancient philosophies of Greece. Written by a lifelong student and teacher of philosophy, its age-old authenticity is clothed in easy to understand modern terminology. In addition, the text is sprinkled throughout with quotations that illuminate her message as well as expand its understanding. The author begins with an explanation of what constitutes stress and how it affects the body. You then have the opportunity to learn what constitutes stress for you. The book educates the reader in logical prose, with well-stated examples. Then the reader can deepen her or his understanding of what is being taught through exercises in getting to know her or himself. These exercises in the form of questions to be answered are designed to help the reader learn to see their lives and themselves differently. As they learn to do this, they become happier and more fulfilled and then their lives can change almost effortlessly. In many effective ways, Live A Flourishing Life encourages a spirit of adventure and inspires grateful living. Readers of this clear, concise, enjoyable process book and CD will surely be thankful for what they will have learned about themselves and their lives. They will be far more knowledgeable and better able to in the words of the author, "Go forth and live a flourishing life."